Added on October 10, 2016 by sage hammond. Sapphire Beach is a St. Thomas Beach Wedding location that is often overlooked. 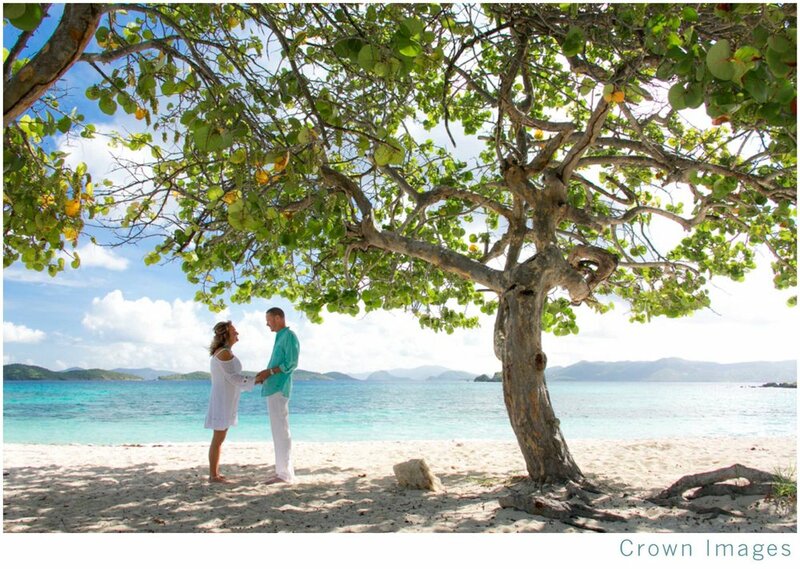 It's a beautiful beach on the east end with endless options for your wedding ceremony. This beach faces St. John. Up until recently, the beach was under-developed with decrepit buildings on its property. Within the past couple of years, there has been a lot of upgrades, including new facades on all the apartment rentals and there is a lot of progress on several pop-up restaurants, including a full restaurant by the pool, which is rumored to open in 2017. There is a site fee at this beach, starting at $150. There is no entrance fee for guests at this beach, and there is ample parking if needed. This beach is a long one compared to some of the other beaches in St. Thomas. On one end--the left--it's rocky, then it turns into the beach where everyone swims. If you keep going to the right, the beach levels out, so it's a great place for your St. Thomas Beach Wedding ceremony. This part of the beach can hold hundreds of people if you have that many guests. This is also a great place to set up a tent with some tables to have your reception! If you keep trekking to the right, you'll come upon Pretty Klip Point, which is a peninsula that points toward St. John. This is a great spot for weddings with the picturesque rocks and plants. This spot is great for smaller weddings. It's important to keep in mind that this beach can be very windy, so if you plan to wear your hair down, you may want to consider a different venue for your St. Thomas Beach Wedding. If you have flowing dresses for your bridesmaids or yourself, it's a great option for photos! This beach is awesome for morning and early afternoon weddings. The turquoise waters are beautifully bright! Here is another post to show what the light looks like at Sapphire Beach in the evening before sunset.